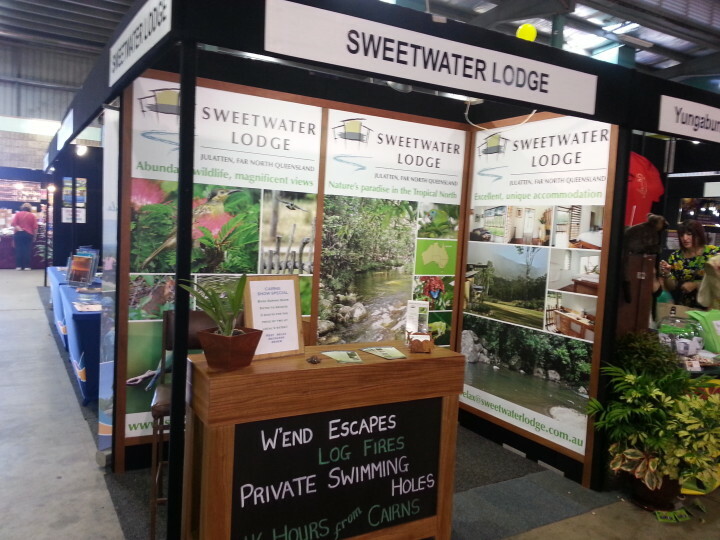 I really enjoyed spreading the word on Sweetwater Lodge at the Cairns Show last week, the hidden gem of Tableland Accommodation in Tropical North Queensland. It was lovely chatting to all the locals and people who have never heard of us or considered Julatten for their destination for weekends away. Underwood Party Hire had a great set up in the Fred Moule pavilion which made setting up for the show really easy. I was also so thankful to have my husband Glenn, (aka Julatten Joinery), to knock me up the perfect piece of furniture to finish off my stand. He also managed to frame all my posters with lovely timber so that they looked amazing! I’ve even had people drop in to Sweetwater since the show to see for themselves how beautiful this place really is! The pictures tell a thousand words but there is nothing like experiencing the beauty for yourselves! Sweetwater Lodge offers premier Tablelands accommodation, exclusive and private in nature’s paradise.